In November 2002, ASEAN and China signed a Free Trade Area (FTA) agreement. Before 2002, there was an estimation that both regions would gain from FTA deals. However, the rapid growth of China since the early 1990s had caused trade and investment diversions to ASEAN. The strong competition between the regions in the international commodity market and productive foreign capital has produced a great deal of stress within ASEAN economies. The economic stress is largely attributed to the structure and similarity of production and exports of ASEAN and China. Theoretically only countries that have the lowest cost of production will gain in trading. Today, nearly 14 years after the agreement was signed, the picture of competitiveness in the commodity market should show a new trend of competitiveness. With respect to Indonesia, the Business Chamber of Commerce Indonesia (KADIN) and industrialists, had complained that the ACFTA actually caused losses to local manufacturers and businesses, in particular consumer goods products such as textile and clothing, and electrical and electronics sectors. 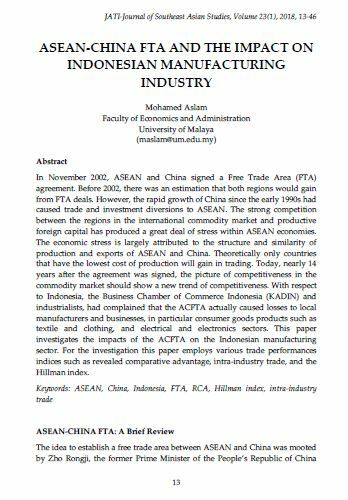 This paper investigates the impacts of the ACFTA on the Indonesian manufacturing sector. For the investigation this paper employs various trade performances indices such as revealed comparative advantage, intra-industry trade, and the Hillman index. ASLAM, Mohamed. ASEAN-CHINA FTA AND THE IMPACT ON INDONESIAN MANUFACTURING INDUSTRY. JATI - JOURNAL OF SOUTHEAST ASIAN STUDIES, [S.l. ], v. 23, n. 1, p. 13-46, june 2018. ISSN 2600-8653. Available at: <https://jati.um.edu.my/article/view/12185>. Date accessed: 20 apr. 2019. doi: https://doi.org/10.22452/jati.vol23no1.2.